ChiChi... she was one of my oldest and dearest friends and has been in my life since 1995. 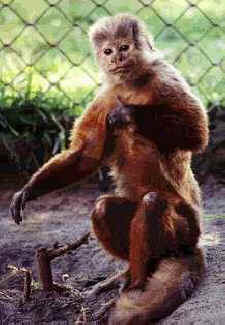 I was told that ChiChi had been in a circus before she was bought by a monkey breeder. When the breeder went out of business, he planned to sell ChiChi to the highest bidder at an animal auction; of course, I could not let that happen. ChiChi joined the Jungle Friends family and was with us for 20 amazing years. ChiChi taught me to be fearless and determined and most of all - she taught me to dance like no one was watching. I am writing to you today through my tears to tell you about ChiChi's life with us at Jungle Friends and her passing yesterday. ChiChi, she was one of my oldest and dearest friends and has been in my life since 1995. 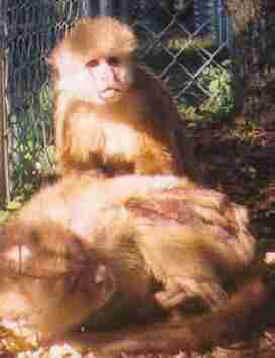 I was told that ChiChi had been in a circus before she was bought by a monkey breeder. When the breeder went out of business, he planned to sell ChiChi to the highest bidder at an animal auction; of course, I could not let that happen. ChiChi joined the Jungle Friends family and was with us for 20 amazing years. ChiChi loved to sing and dance, she would serenade you with her songs, dance and twirl and practically stand on her head, and she fully expected anyone in view to join in the dance! ChiChi was my favorite dance partner. ChiChi met her soul mate, Jimmy Sr. in 2001 and lived with him for 10 years until he passed of heart failure due to his advanced age. 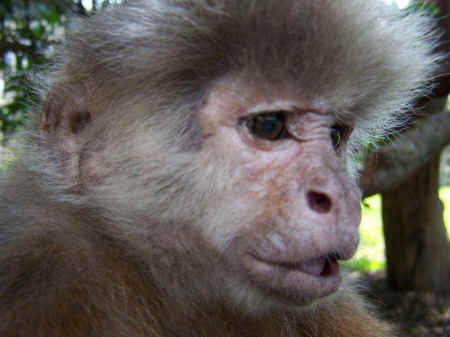 ChiChi was introduced to Puchi and Wendell, which eased her pain of losing Jimmy Sr. Watch this video to see how much fun ChiChi and Wendell had, for two older monkeys; they certainly enjoyed some rambunctious play. ChiChi was also a very compassionate being, as this video demonstrates, as she grooms Wendell when they were reunited after a stay in the clinic for Wendell, due to his diabetes. On July, 25, 2012 ChiChi saw Dr. Schirmer due to a lump on her breast that had erupted through her skin. Unfortunately, the diagnosis was not good -- mammary carcinoma. The tumor and her lymph node had metastasized and were removed. 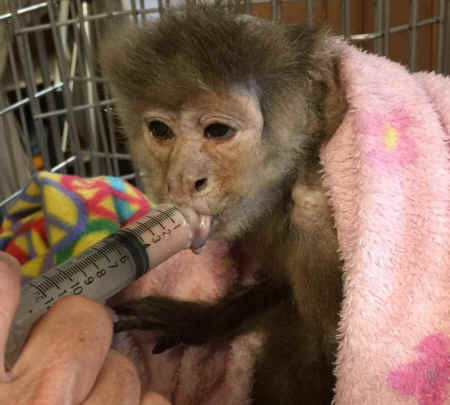 Even though ChiChi's prognosis was poor, and she was only expected to live for several more months -- at Jungle Friends Primate Sanctuary, we believe in Monkey Miracles. ChiChi lived for three more years. When Gussie passed due to old age leaving her daughter Joni alone, she was introduced to ChiChi and her friends. Joni and ChiChi really hit it off, it was apparent that ChiChi enjoyed the company of her new girlfriend Joni. The girls took turns grooming each other. 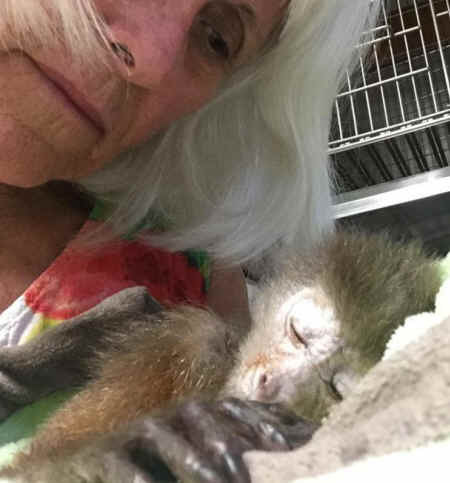 I think we all knew several days ago that ChiChi was not long for this world; my fear was that she would pass in the night, alone in the clinic -- she was just too weak to move her back into her habitat with Joni. Yesterday morning when Bri went into the clinic ChiChi raised her head to acknowledge Bri, but laid it back down. Bri radioed that I needed to come to the clinic. When I saw ChiChi, she looked so tired, she refused food and drink, my heart was aching. We contacted ChiChi's local human friends and asked them to come as soon as possible -- it was as if ChiChi waited until all of her friends arrived to say good bye. ChiChi had more friends than most, she was so loved. Those friends who couldn't be here for ChiChi's departure sent their love and I know ChiChi felt wrapped in love. In this video Mary Anne, our special-needs coordinator sang to ChiChi as she left this life for the next. ChiChi looked so peaceful. ChiChi taught me to be fearless and determined and most of all -- she taught me to dance like no one was watching.